First time hosting account buyers, probably in the age range of 12-20 will see the promises of unlimited resources for a small fee of 3.95/month. It seems unbelievable and users hop right aboard that ship. For many users, they'll never need anything more. 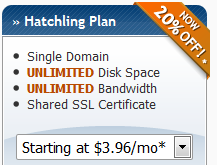 Their static HTML pages and 6 hits a day is perfect for these type of hosting plans. The company fits hundreds of clients onto the servers, in hopes for users like described above, who pay 4 bucks a month and do absolutely nothing on their servers. However, we do have clients who are purchasing a chunk of a server to host a blog or forum. Instantly, they are in danger. The company may promise unlimited, but lets examine some Terms of Service from some shared hosting websites. Hello, I have unlimited resources. I can host all your files for you. Granted, that you are allowed to host direct files on your plan and that your bandwidth can handle it. Most shared providers throttle the bandwidth per account so you cannot share a file at 1mbps (to prevent abuse). Users just didn't understand what shared hosting was. Shared Hosting was meant for very small personal portfolios or static HTML pages.